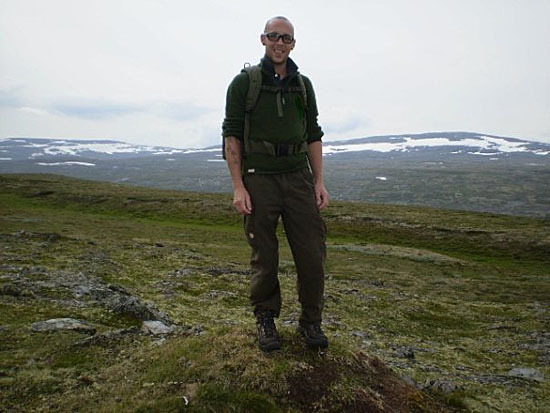 I have known Ian Lawson for quite a few years now – I hired Ian onto the team of outdoor staff at Woodlore Ltd, where he has led Introduction to Bushcraft, Fundamental Bushcraft, and Campcraft courses. He is a skilled and capable woodsman, with a natural affinity for axework and carving. In addition to his professional involvement in the teaching of bushcraft, Ian owns and runs a tree surgery business in Cambridgeshire. While studying edible wild plants, Ian has been fascinated by the similar deadly poisonous species and this is reflected in his first guest article for my blog, below. Learning which plants and fungi can provide us with a meal in the wilderness is a most empowering exercise. The ability to go out and make shelter and find water allows us to survive for a period measured in days. The ability to find sustenance from the land is truly the difference between survival and living in wild places in some comfort, for an extended period of time. In learning about edible plants, I have come to find that my attention has been concentrated more towards those plants which should not be eaten. In fact poisonous plants and fungi have fascinated me. This is not as useless an interest as it might first appear. 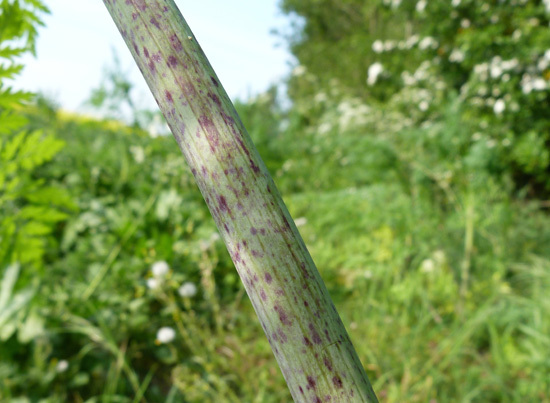 I firmly believe that to know about wild foods you must also know what not to eat; not least because there are only a few deadly poisonous plants in Britain and Europe that can be confused for edible plants, whereas there are many edible species. I also believe that you should get to know the enemy in as much detail as possible. If you know the ways in which plants can affect you, poisoning can be diagnosed earlier in others as well as in ourselves. Foraging has quickly become a fashionable pastime, which makes for good TV but, all too often, poor plant education. In teaching others about wild foods you should never neglect to tell them about the other similar plants – often in the same family – for which they can be confused. A plant which I have seen on television being shown as edible is cow parsley, Anthriscus sylvestris. A glade of cow parsley, Anthriscus sylvestris. Photo: Ian Lawson. Cow parsley belongs to a family of plants called Apiaceae, more commonly known as the carrot family. There are many plants in this family with which you will be familiar – plants such as coriander, parsnip, parsley and, of course, carrots. The carrot family also includes edible wild plants such as Pignut, Conopodium majus. This family, however, contains one of the most notoriously toxic plants – Hemlock, Conium maculatum. Hemlock is a biennial plant, growing to between 1.5 and 2.5m (4-7ft) in height. 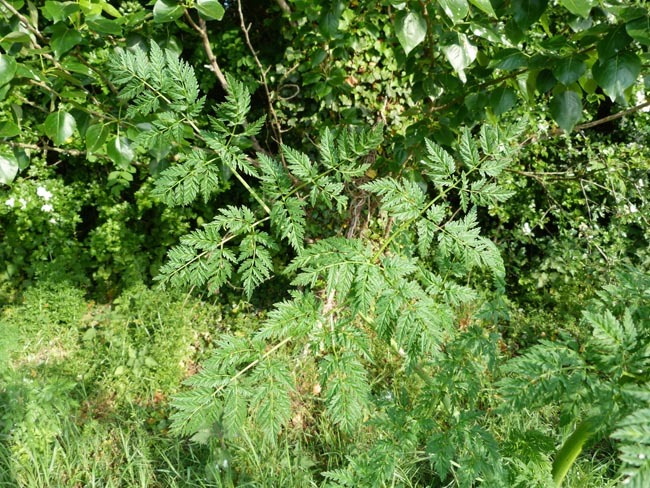 It has large, lacy leaves and purple spots and streaks on the stems. It is found, naturalised, in many parts of the world. It is usually found on poorly drained soils, roadsides, field edges and waste areas. 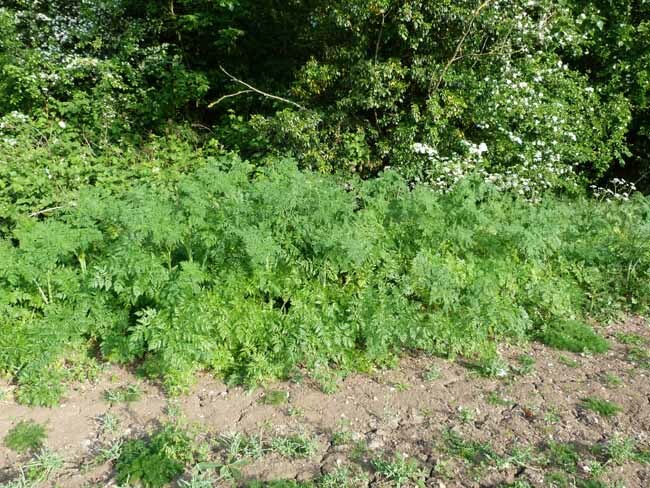 A row of hemlock, Conium maculatum, growing in front of a ditch on the edge of an arable field - hemlock likes both damp and fertile soil. Note there is also cow parsley (flowering) behind the hemlock. Cambridgeshire, May. Photo: Ian Lawson. 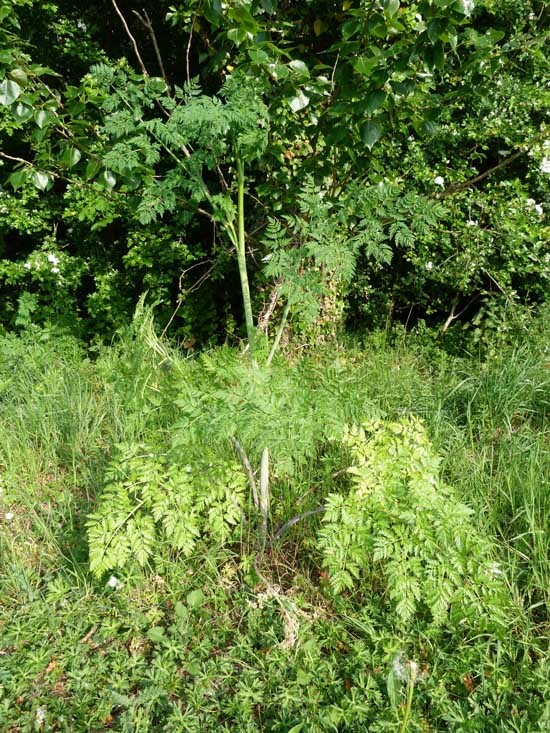 Hemlock, Conium maculatum, typically grows to a height of between 1.5 and 2.5 m (4-7ft). Cambridgeshire, May. Photo: Ian Lawson. 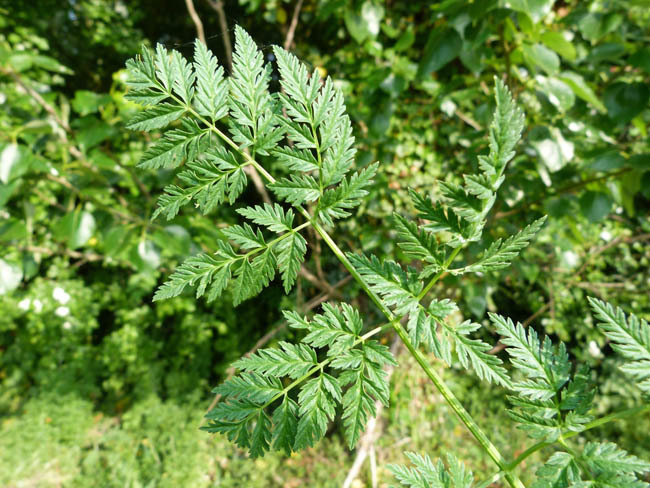 Leaves of hemlock, Conium maculatum - large, lacy, triangular and 2-4 times pinnate. Photo: Ian Lawson. 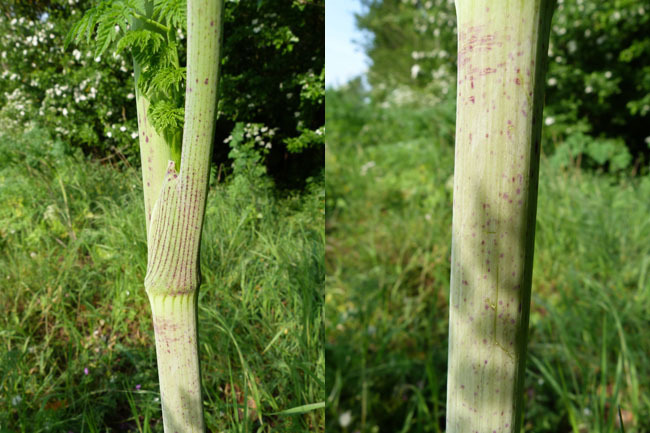 Hemlock, Conium maculatum, stem details: Hairless and with typical purple markings. Photos: Ian Lawson. Hemlock contains toxic alkaloids. If consumed, these alkaloids can be fatal to humans as well as all classes of livestock. The main toxin is called coniine. It is a compound which is very similar to nicotine. Coniine is a neurotoxin. Poisoning usually results in death by respiratory failure caused by ascending muscular paralysis. The lethal dose, for an adult, is about 100mg. This equates to 6-8 leaves. The toxins are in higher concentrations in the seeds and roots. The roots can be confused with edible roots in the same family such as parsnips. Death of victims has been prevented by induced coma and artificial ventilation until the effects have worn off 48-72 hours later. An early diagnosis is vital. Some of the early symptoms are gastritis and central nervous system stimulation (tremor, ataxia and seizures). You could also observe increased heart rate, salivation, dilated pupils and profuse sweating. 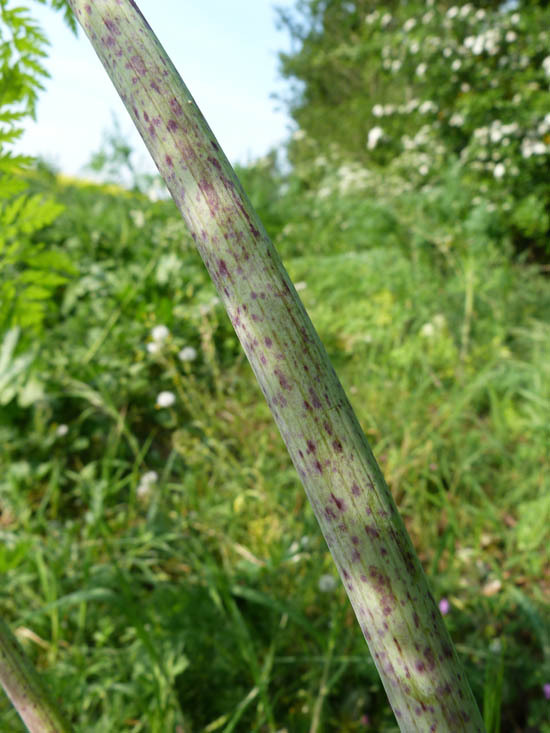 The two most characteristic visible features of Hemlock, Conium maculatum, are the smooth stem and the irregular purple blotches. Photo: Ian Lawson. 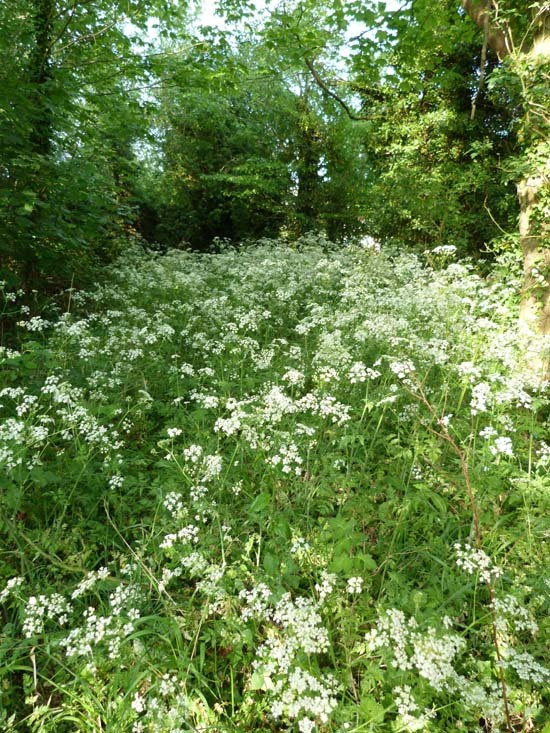 When we go out for a walk we might not think twice about walking through an inviting glade of cow parsley. Knowing that its relatives have dark secrets opens our eyes to the deceptive subtleties of plants and foraging for wild foods. While knowing which plants can sustain us is certainly empowering, knowing the harm some plants can cause us gives us a more humbled position in nature. This article is meant only as a guide. It is not a complete treatment of all plants that may also be present in the habitat where you find the above-mentioned plants. If you want to learn more about plant identification you should invest in some good field guides. The safest way to learn about wild plants is for someone who already has the knowledge to show you in person. Any idenification of poisonous plants or edible wild plants you do on your own is at your own risk. Excellent article and great pictures, didn’t have a clue how to spot it. I guess you have just saved my life! Nice to know we have done a good deed! I was at a local nature reserve on Monday looking for sign of the Otters rumoured to be there as I’ve just come back from a Woodlore ‘Woodsense’ tracking course with Ian. Whilst I was at the nature reserve I saw lots of what I thought was, and now know to be, Hemlock. No Otters, no Otter latrines and no Otter feeding sign that I could see though! I hope Ian will keep in touch with us through this Blog and let us know how he gets on in NZ. Good luck Ian, our loss is NZ gain. Hi, good article and very good I.D. pics, are there and issues with hemlock pollen on edible food/plants around the hemlock ? I’ve not read of any cases of poisoning this way but that doesn’t mean it’s not a risk. So I asked someone who knows a great deal more about plants than I’ll ever know and he thinks it unlikely although is not certain. Hence, I would say the cautious approach would be to avoid edible wild plants in the immediate vicinity. Thanks, a great article, very good pictures. I was on the same group with Ian when we both attended the Woodlore Journeyman course, his knowledge and skills definitly helped us all get through a very hard, but very enjoyable week. I read here that he is off to New Zealand, good luck with that and more articles please. Is hemlock even more toxic than yew berries? Hemlock, Conium maculatum and yew, Taxus baccata, both contain highly toxic compounds. The compounds themselves are different, however, and it’s a somewhat academic exercise to try to come up with some measure of relative toxicity, not least because toxicity varies seasonally. Little of either species needs to be ingested to cause significant poisoning, even death. In the case of yew, a lethal dose for an adult person has been reported to be 50 g of fresh yew leaves. In the case of hemlock , a lethal does for adults is reported to be 100 to 300 mg of the toxic alkaloids, which translates to 13 to 67 g of leaves. More information here. Ive only recently become aware of poisons in nature and found this article very interesting. I have previously heard of lanburnam seeds being poisonous. I thought rowan seeds also poisonous but apparently you can make a drink from them.The birds flock to the tree as if holding a party and seem to love the berries.Im not sure I would like it even if it werent potentially dangerous. Can a person really die from brushing past an aconite plant with bare legs? And if you wanted to know if someone was being deliberately poisoned how would you go about it?